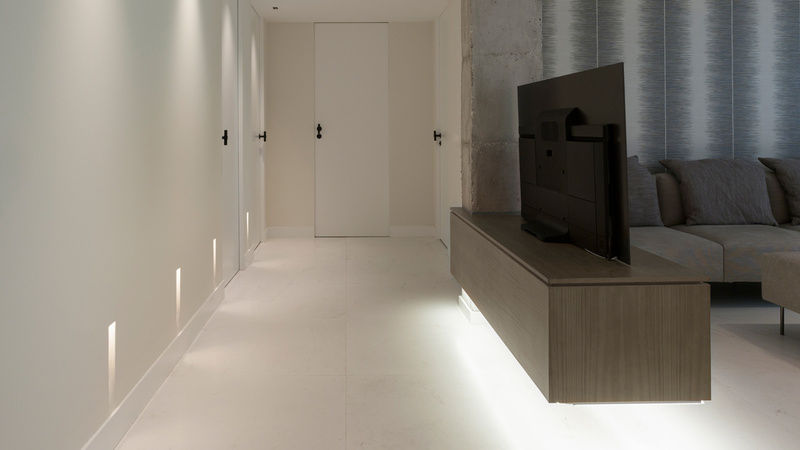 The SINMAS interior design studio has used materials from Venis, Gamadecor, Butech, Noken and Krion on this house, and with them, it has greatly enhanced the light in all the rooms. With the demolition of the vertical parameters, the removal of the hall ways and the extension for the large windows, all the rooms in this house are nicely connected and this enhances user comfort. 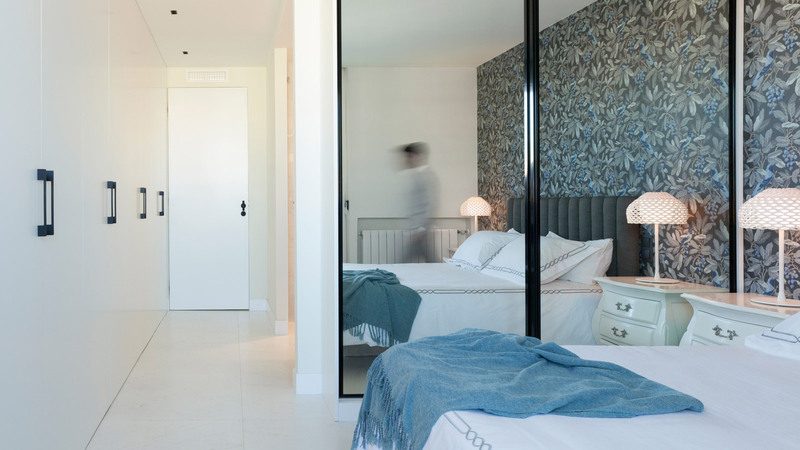 Making the most of the natural Mediterranean light, and enhancing its possibilities was the objective for the SINMAS Studio. The interior design studio went right back to the architectural origins of this house by removing the hall ways and the doors, resulting in the coming together of the spaces and the extension for the large windows, too. A structure which is similar to a sea house, but in the centre of Valencia. 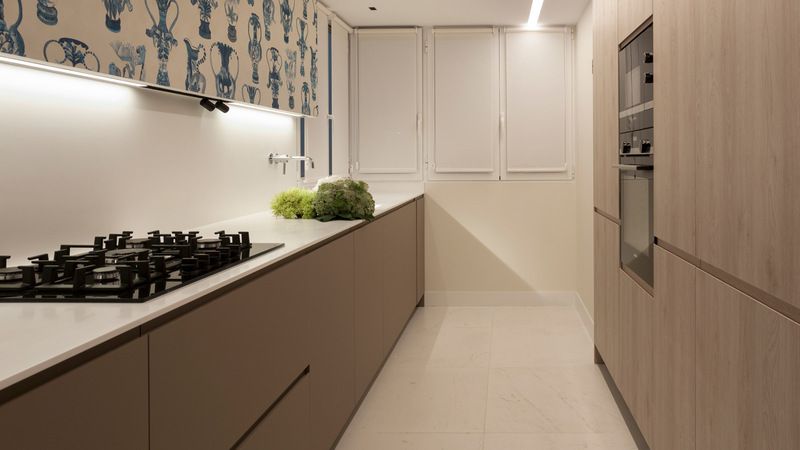 The white tones and the earth tones, the textures based on marble, the wall units and the volume combinations are supported by the materials from the PORCELANOSA Grupo. 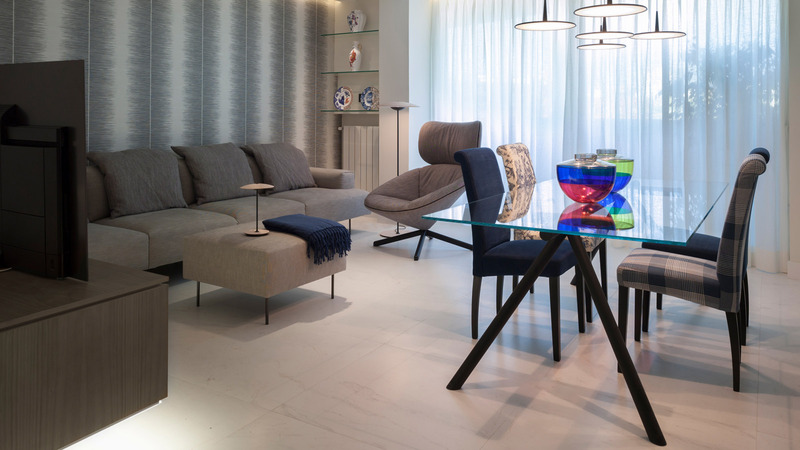 In the open and shared spaces in this house, the Rivoli collection from Venis has been used. 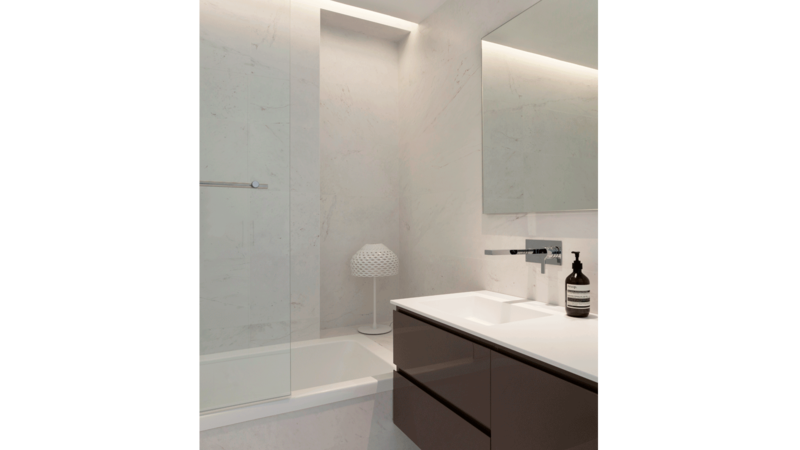 Inspired by the white Carrara marble, this porcelain has been used as a floor tile and a wall tile in not only the kitchen and the living-room but also in the bathroom, because of the spacious effect that the rooms provide. 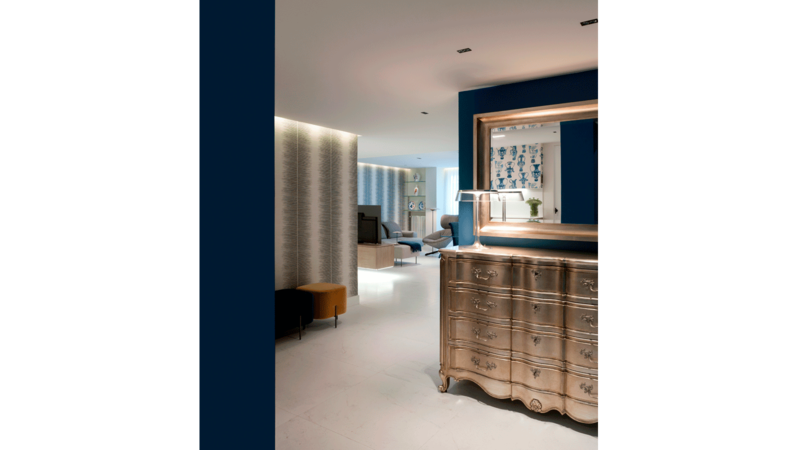 The sobriety of Rivoli fuses with the blue painted wallpaper, which provides both lightness and freshness to all the different parts. The Tanzania ceramic wood in the Taupe finish which defines the showers in this house, is from the Starwood collection from the PORCELANOSA Grupo. Its Outdoor technology turns it into a waterproof material, which is also resistant to: humidity, sunlight and chemical cleaners. Created under a sustainable production system, its composition does not have any pores, which makes it both natural and comfortable to touch. In the bathrooms, the Shower Deck show tray from Butech has been fitted, which allows for the water to be filtered through the joints in the Tanzania flooring. 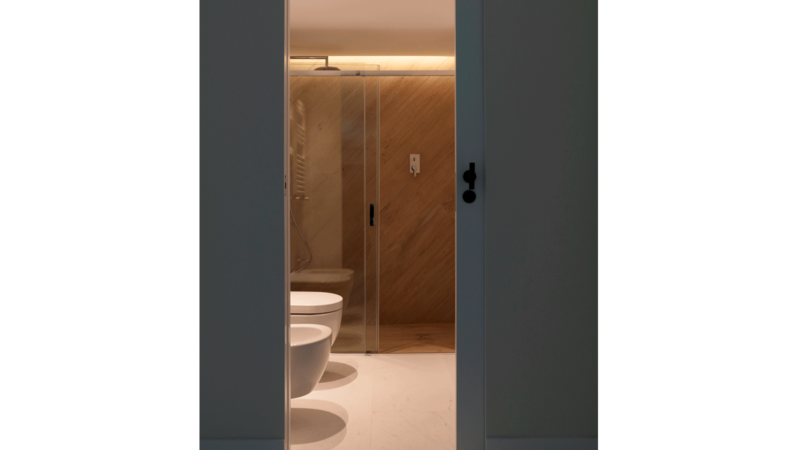 Its functional design fulfils all the different aesthetical needs of this project, since the shower tray fits in perfectly and, it keeps the structure of the set nicely hidden.